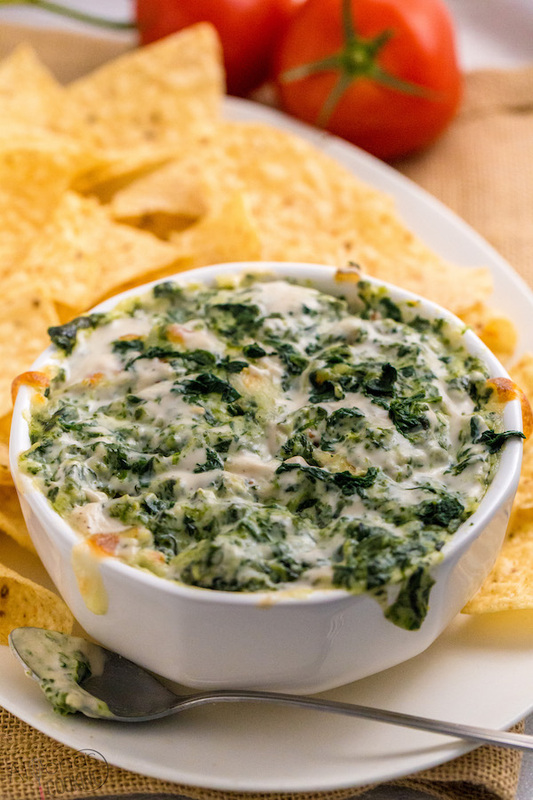 This hot spinach dip recipe makes one of the creamiest, easiest and delicious appetizers! Serve as party dip or a late afternoon snack that kids can even enjoy! 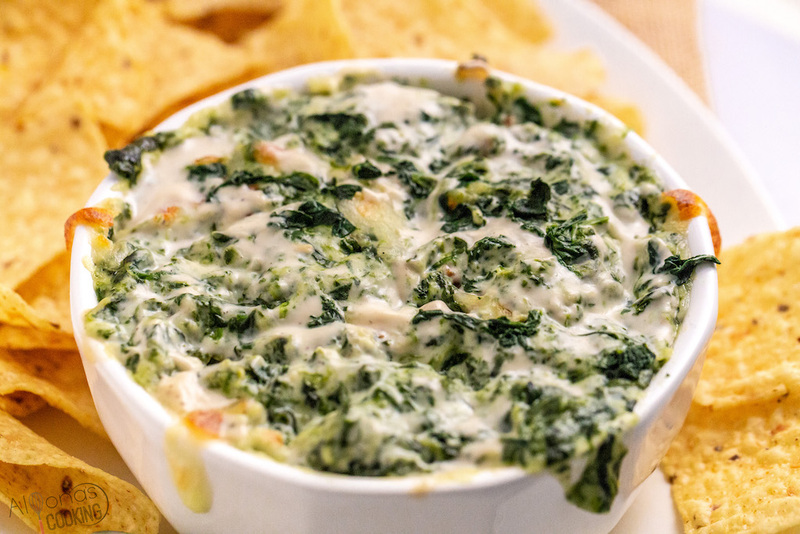 A low carb dip that can be made from fresh or frozen spinach! This spinach dip is super easy and doesn’t even need to be baked! As soon as the spinach leaves heat thoroughly and the cheeses melt, it’s done! However, if you did want to bake spinach dip, this recipe works both directions, either make and serve or transfer into the oven for an extra fancy dip (which is why it also makes a perfect plan ahead dip because you can completely set aside and bake for later!) 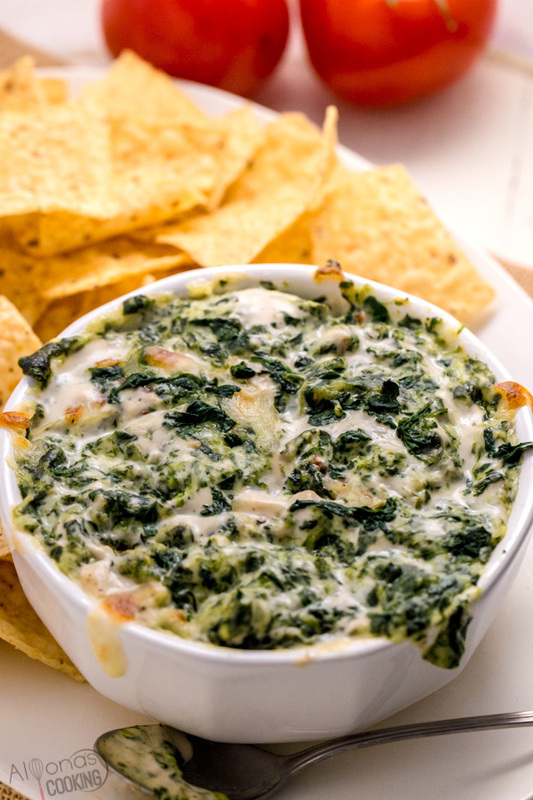 This spinach dip is best hot, but still as delicious cold. It can be a challenge to decide what spinach dip to make. 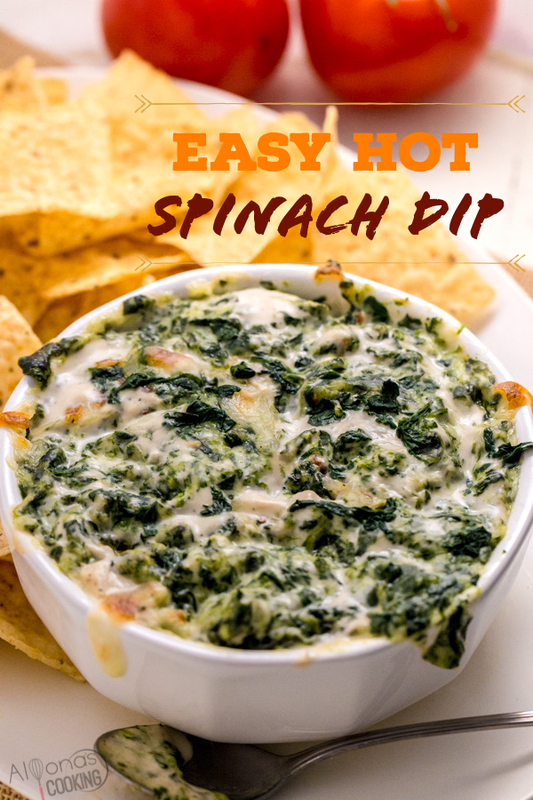 Although hot spinach artichoke dip, easy cold spinach dip or baked spinach dip can all seam like impressive ideas, it came down to my ultimate favorite way to make spinach dip! My children love this dip and it’s nice to know it can be made from fresh ingredients and done simple! So why should I make this Spinach Dip? Can be made from fresh or frozen spinach leaves. Can be made in one pan then transferred directly to the oven for a fancy bubbly dip. Simple ingredients make it easy to prepare without making any trips to the store. Tastes deliciously rich and creamy and even kids can even eat this spinach dip! To make this dip using fresh spinach leaves, you’d want to start with wilting your spinach leaves. Wilting or cooking down the spinach leaves is crucial as fresh spinach can cook down quite a lot and it’s also important to coarsely chop the spinach, otherwise you will have long stringy spinach to chew down. Next, you’d want to melt the cream cheese first and the rest come together easily. 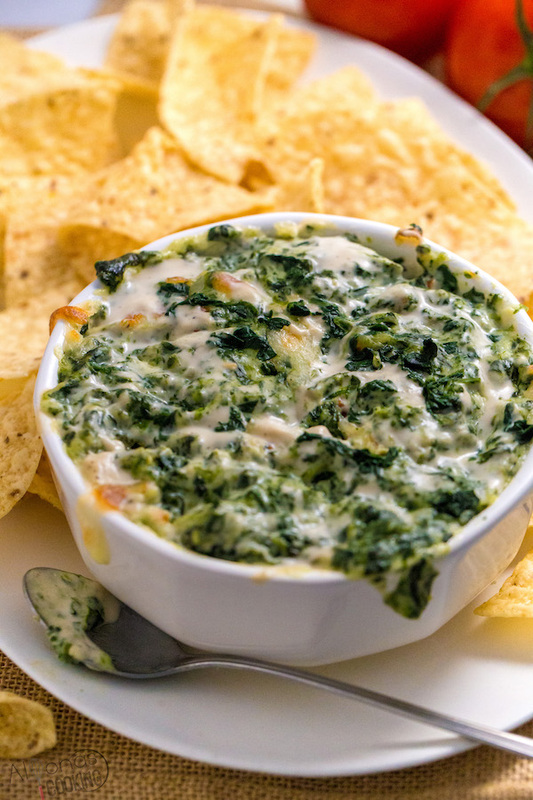 What to serve with spinach dip? Spinach dip is best served with tortilla chips but crusty bread (aka toasted baguette slices), crackers or veggies can all make good dipping options. Can you make ahead spinach dip? Yes! In fact this recipe makes it super make ahead friendly as it can be made then cooled and set aside for baking later or just re-heating in the microwave. Yes! I have frozen spinach dip before and it’s as easy as popping the frozen dip out of a zip loc bag and placing it into a saucepan, it melts fast and is just as good as making it fresh! In an oven safe skillet, sauté garlic in 1 tbsp of oil. Add freshly chopped spinach and cook over medium heat until spinach leaves start shrinking. Stir in the cream cheese and melt. Add in the remaining ingredients. Heat thoroughly until bubbly and smooth. Optional; but dip can be transferred and broiled over low heat with an addition of grated cheese over the top for an extra fancy looking dip. Otherwise can be served right after step 3. NOTE: This recipe calls for fresh spinach. To use frozen spinach, squeeze excess liquid out and simply add AFTER the cream cheese melts to retain a green color. Note: Over heating the spinach or cooking too long can make the green spinach color dull. TO MAKE AHEAD: Prepare as instructed to step 3. Cool completely before refrigerating. When ready to serve, garnish with additional grated cheese and broil over low, until hot. TO FREEZE: Transfer cooled dip into a zip-loc bag and squeeze out as much air as possible. When ready to serve, simply tear off zip loc bag and pop frozen spinach dip into a saucepan. Heat over med-high heat until bubbly and hot. recipe calls for oven safe pan, and article mentions oven, yet no oven time is mentioned in the recipe. Even the pictures look browned. My apology if I made the article confusing however, this dip is very versatile. I did mention how you can go both directions using the oven or eating right after making on the stove top, which is why it’s best to use an oven safe skillet incase you would want to take the extra step to broil the dip for a nice crust. You can certainly make and transfer the dip to a preferred baking dish of your choice if going that direction but it’s really unnecessary as it can be eaten right after preparing. This is perfect for my keto diet! Thanks for posting!